In April 1893, seven doctors seceded from Boston’s College of Physicians and Surgeons. Each chipped in $50 to start a new medical school at 188 Boylston Street under the auspices of Tufts College. 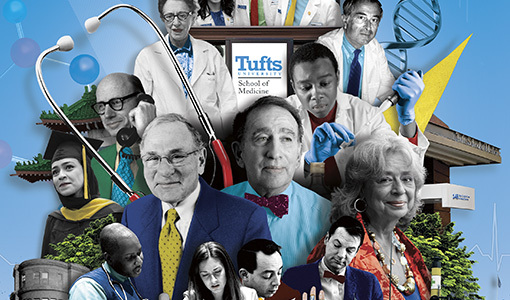 Many thousands of graduates and a few converted garment factories later, Tufts University School of Medicine this year celebrates a century-and-a-quarter of medical excellence. From enrolling an initial class that was over one-quarter women to sponsoring the country’s first two community health centers, the school has always been on the cutting edge. Ahead, we explore some of the discoveries, pioneers, and innovations at the heart of this school. But we also want to hear what the School of Medicine means to you—please send your thoughts and memories to courtney.hollands@tufts.edu.